At each of Intuit’s Small Business Hackathons, participants are asked to develop a solution that saves small businesses time or money. The broad challenge is meant to encourage innovation and creativity, and participants never fail to deliver both in spades. 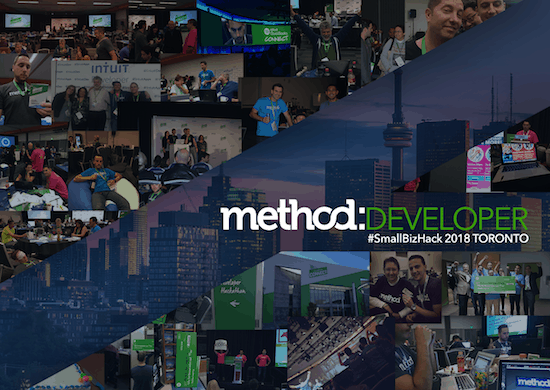 On December 1-2, the Method:CRM team had the pleasure of being an API partner at the Toronto hackathon. It was an incredible experience to see the teams work together to solve small business problems in a big way. After two days, a lot of food, minimal sleep, and 22 app pitches, here’s how things went down. Most people know the struggle of waiting for a service technician to arrive sometime between 11 am and 7 pm. Why can’t the technician provide a more accurate ETA? But on the technician’s side, scheduling isn’t as simple as looking at a calendar. Their ability to show up on time depends on what they encountered at their last job, and at the job before that. When there’s miscommunication about what is required at one job, it leads to delays for subsequent jobs and lost revenue. Enter EstiMate, the first place winner at this year’s hackathon. The app helps service businesses scope out work before going onsite so they can schedule and estimate jobs more accurately. Technicians can communicate with customers directly in the app via SMS. When the customer provides a photo or video of their job, the app grabs information about the image, compares it to previous jobs and automatically generates a QuickBooks estimate. This app is a game-changer for small service businesses: when they have better information ahead of time, they can provide better service and increase their bottom line. Small business owners are experts at running their businesses, but they’re not necessarily financial experts. This means it can be tricky for them to access the financial information they need, right when they need it. Enter Luca — Alexa’s CPA cousin and the hackathon’s second place winner. The app uses voice recognition technology to allow business owners to ask questions about their finances and receive instant answers. Luca is already programmed to understand common financial queries (like “What is my net income?”), but users can also add their own questions to the app’s database. This financially savvy voice assistant empowers small business owners to save time while staying on top of their accounting data. It’s estimated that there will be 70 million contract workers in the United States by 2020. Many small businesses may come to rely largely on independent contractors rather than employees. But how will business owners effectively manage these workers? The third place winner at the hackathon was Strad.io, an app that gives small businesses a centralized view of their contract workforces. This informational hub allows users to see each worker’s contract, contact information, invoices and activities all in one place. As a result, small business owners can focus on bringing in the help they need, without worrying about increasing their administrative workload. Description: An end-to-end solution for appointment booking, management and invoicing. Description: A chatbot that makes it easier to track and log business expenses. Description: An app that extracts and analyzes data from customer support calls to provide actionable insights and priorities. Description: An app that allows subscription-based businesses to easily track and manage their customer subscriptions and resource utilization. Description: An agricultural commodity trading platform powered by blockchain that directly connects farmers with end buyers. Description: An app that uses image recognition and data analytics to help small businesses generate and schedule social media posts. Description: An inventory management app that tracks product levels and automatically places orders based on past sales trends. Description: A point-of-sale system and UPC scanner for small neighborhood convenience stores. Description: An app that helps new small business owners anticipate future costs and forecast future sales. Description: An inventory management app that allows retailers and suppliers to stay up-to-date on product number changes. Description: An online marketplace that allows small businesses to exchange goods and services with their peers. Description: A QuickBooks Online integration that allows small businesses to compare their financial health against similar-sized businesses and industry averages. Description: A service-sharing platform with enhanced security and authentication features for service providers and customers. Description: An app that enables small e-commerce businesses to increase their global reach by connecting international shoppers with travelers who can bring them their products. Description: An online marketplace where small businesses can offer services and bid on each other’s services. Description: An integrated financial statistics dashboard that provides insights from all of the online platforms where e-commerce businesses sell their products. Description: An app that uses consumer purchasing data and machine learning to provide small businesses with insights into market trends. Description: An app that automatically transcribes and analyzes customer support calls. Congratulations to all of the teams and a big thank you to Intuit for inviting us to participate! We can’t wait to see more amazing small business solutions at the 2019 hackathons.